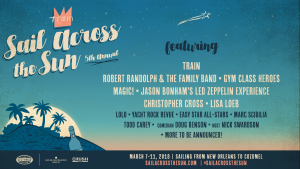 Train invites vacationers to “Drink Up” as the GRAMMY® winning rock band announces their 5th annual Sail Across The Sun music and wine festival. Joining the more than 2,000 lucky vacationers will be Robert Randolph & The Family Band, Gym Class Heroes, MAGIC!, legacy rockers Jason Bonham’s Led Zeppelin Experience, “Sailing” singer Christopher Cross, Lisa Loeb, LOLO, Yacht Rock Revue, Easy Star All-Stars, genre-jumping singer/songwriter Marc Scibilia, Todd Carey, comedian/actor Doug Benson and special guest host, Reno 911! Funnyman Nick Swardson. The 4-night floating festival will travel between New Orleans and Cozumel, Mexico from March 7-11, 2018 aboard the beautiful Norwegian Pearl. Join the presale for this cruise vacation now at SailAcrossTheSun.com! Book during the pre-sale and get exclusive access to a photo with Train while on board. Sail Across the Sun vacationers will be treated to autograph sessions with supporting artists and dozens of musical performances across five stages, including three headlining shows from their roots-rocking hosts, Train. Additional entertainers will be added to the diverse lineup in the coming months. Relive 2017’s 4th Annual Sail Across the Sun at: sailacrossthesun.com/experience/. With 15 decks of dining and entertainment, Norwegian Pearl is a destination of her own, offering guests access to 13 bars and lounges, 19 dining experiences, one outdoor pool, hot tubs, and an award-winning spa. Guests can also shoot some hoops on the sports court, bowl a few frames at the onboard bowling alley or try and tempt lady luck at the Pearl Club Casino. Plus, audiophiles and vinophiles alike will enjoy a day-long excursion to the Caribbean paradise of Cozumel, Mexico, where fantastic fishing, snorkeling and boating opportunities await adventurous travelers. Double occupancy staterooms aboard the 5thannual Sail Across The Sun begin at $975 per person, plus taxes and fees. For more information about booking your vacation, visit us online at sailacrossthesun.com/ or call Sixthman directly at 877-379-9177 between the hours of 10am ET and 6pm ET.